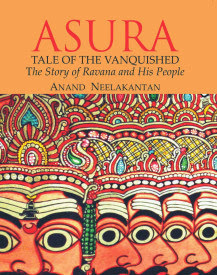 Asura – Tale of the Vanquished by Anand Neelakantan is a very different book on the Indian mythological epic, Ramayana. To put in simple words, it is a radical take on our conventional Ramayana. Read it with an open mind and you will be able to appreciate the author’s view. We have all heard the epic tale of Ramayana. My earliest memories of it are of the Ramayana serial by Ramananda Sagar, which was telecast on Doordarshan. I was a kid then but even then, I knew that Rama was the hero and Ravana was evil personified. This belief is deeply rooted in us Indians. That is why when I read this book Asura by Anand Neelakantan; it took me a while to absorb what I read. The blurb of the book best describes what the book is all about. The story of the Ramayana had been told innumerable times. The enthralling story of Rama, the incarnation of God, who slew Ravana, the evil demon of darkness, is known to every Indian. And in the pages of history, as always, it is the version told by the victor that lives on. The voice of the vanquished remains lost in silence. I have always held Ramayana and Mahabharata in awe. They are the treasure of Indian mythology. It takes a genius to have a different take on stories that have been there in our society for ages. The author has done exactly that. But, that doesn’t mean that I don’t have my problems with this book. Let me elaborate a bit. The story of ‘Asura’ is narrated by two people. One is Ravana himself and the other is his follower, a common man – Bhadra. Ravana is depicted as a more humane character than we have always perceived him to be. He has with his own strengths and weaknesses, dreams and fears. He is driven by ambition and that is what makes him the lord of the Demons. He leads his people through numerous victories and carves out a vast empire from the Devas. Bhadra is a common man who follows Ravana throughout his journey to the throne and after. He has his own reason for his enmity with the Devas. As readers, we get to know about all the trial and tribulations in his life as well. I think the book could have been shorter; it could have been better edited. In many stances, I felt like skipping pages. The self-conversations of Ravana and Bhadra that were sprinkled generously throughout the book were at times drag and made the read monotonous. I would have appreciated the book a bit more if the use of abusive language was kept to a minimum. That the author has put in a lot of effort in the research of the book is evident. You will find that there is an explanation or a new perspective on everything. Overall, I would say that it was great to read a new theory/perspective on Ramayana. It is hard to believe that this is the author’s debut book, he very much writes like a seasoned author. The style of writing is really impressive. You can actually visualize all the scenes in your mind. If you are an Indian mythology enthusiast like me, you can surely pick this book. I read this book sometime back, reviewed it on my blog, upon request from the author. I share much of your thoughts on this book Jyoti. But yes, given that it is the author's debut book, I think he did a tremendous job!